Egyptian artist Huda Lutfi has won the grand prize at the 26th Alexandria Biennale for Mediterranean Countries, which opened on 10 June at the Museum of Fine Arts in Alexandria and will continue until 7 July. “Lutfi’s work is probably the most striking and equally attached to the biennale’s theme [The Will of Change]. 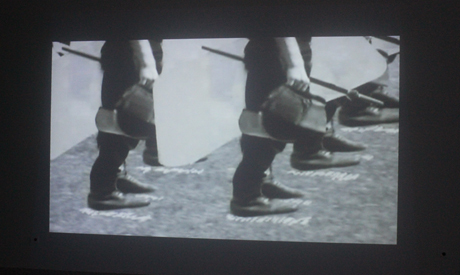 Her video is resonant — not just of the period leading up to the uprising across the country and the region, but also of what has transpired afterwards,” Olu Ougibe, head of the jury commented to Ahram Online when pointing to the military boots depicted in Hoda Lutfi’s work.